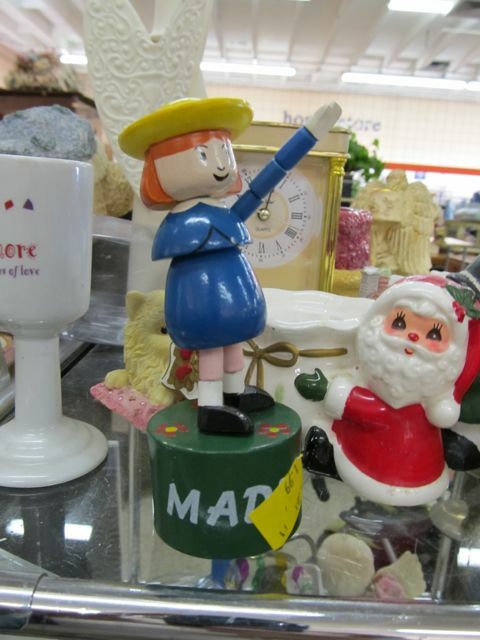 Overpriced Goodwill Item of the Week: Madeline! IN SPITE OF – or due to – having lost an arm when the Luftwaffe destroyed her school during an air raid, little Madeline is seen welcoming German troops into Paris in a hasty show of allegiance to their Führer. Immortalized here as a wooden push-puppet, this whimsical toy – of interest to both collectors of classic children’s book characters and World War II historians – was discovered at my local Goodwill for $1.99. We’re doomed to repeat history unless we learn from it. And what we’ve learned here is that Goodwill really has no qualms about putting broken crap out on the sales floor. Who the hell do they think is going to buy this thing? Someone with another broken Madeline push-puppet who would cannibalize this one for spare parts?! Posted by Ted on December 13, 2011, 2:38 AM.